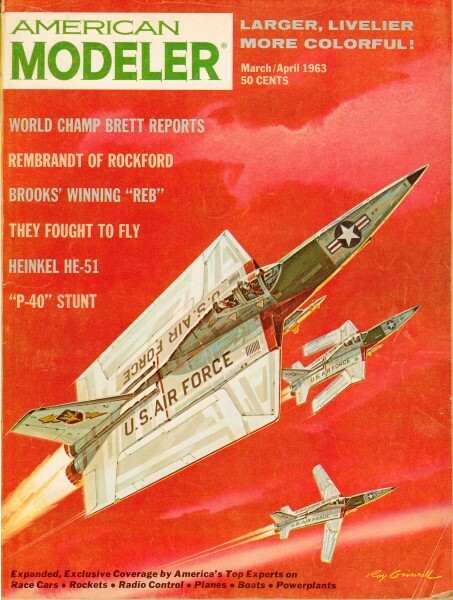 The Ephemeris Class A and FAI free flight model was somewhat of a sensation in the modeling world back in 1963 because it featured up thrust. Its designer, R. Jess Krieser, was "thinking outside the box" before the term was even coined. 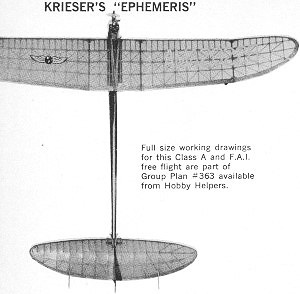 Mr. Krieser took an engineering approach and after examining tables and graphs on L/D curves on airfoil drag coefficients, settled on the final form factor that became the Ephemeris. Read about it here. Wing Area (actual): 450.64 sq. in. Total Projected Area: 580.53 sq. in. Wing Area (proj. ): 442.69 sq. in. Stab Area: 137.84 sq. in. If you think you're looking at a Sailplane wing on a modern hi-thrust contest flyer, you're not far wrong. Designer R. Jess Krieser of Park Forest, Ill., wants you to notice something else: UPTHRUST! At first glance, ''Ephemeris'' may not seem much different than most present hi-thrust free flight contest designs. However, careful study will reveal a very significant difference. This job flys with up-thrust! The balance of forces has been arranged to nullify the looping tendency to the extent that we can fly the airplane with its wing at an angle of attack of one to two degrees negative to the thrust line. Exact amount of negative incidence will vary slightly from one ship to the next; it's determined by flight adjustments. The significant accomplishment here is that we are able to operate with the airfoil performing in the realm of its minimum drag. An examination of L/D curves on various sections will show that drag coefficients are at their minimum from zero to about six degrees negative angle of attack. The exact point at which the minimum drag coefficient is produced will vary from one airfoil to the next, but for the most part they fall within this six-degree range. Some may feel that the gain in efficiency through drag reduction of the airfoil is small. However, when all of the small gains made by refinements in a design are added up, they provide a definite edge in performance which can be important in winning a contest. Another significant difference in Ephemeris is best appreciated when the airplane is flown. For this craft has excellent power-handling ability, and will handle the hottest engines without trouble. Some ships will give a straight-out climb under normal power, but when power is loaded on the old spiral climb becomes necessary to control the airplane. Not so with Ephemeris. No matter what power is applied, she seems to know only one direction - straight up. Recently flown with pure "Blast" as fuel, it made the fastest climb we have ever seen. But the pattern of the climb did not vary from that obtained when using milder fuels. At present, we really don't know what the power handling limitations are of this design. If anyone feels that Ephemeris resembles the Sailplane they are correct. It was my long time admiration of the Sailplane's superb glide that led to development of Ephemeris. It all started in November 1961. I had obtained a set of Sailplane plans from Carl Goldberg intending to build it. Carl and I lunched together one day and I was talking enthusiastically about my intended project. Since the Sailplane was one of his classic designs, I naturally thought he'd be enthused. But he asked me why in the world I wanted to build such as old airplane! I said that it was because I had never flown a free-flight contest ship that would outglide the Sailplane. Carl felt that I was beating a dead horse, and that the Sailplane was an obsolete design which should be forgotten. He contended that one should always move ahead in the free-flight art rather than to build a design more than 20 years old. I half-jokingly asked if he'd be more interested if I made a hi-thrust ship out of it. He replied that this would certainly make a lot more sense, and would be more of an up-to-date approach. So for several weeks I doodled over the Sailplane plans, trying to work it into a hi-thrust configuration. Full size working drawings for this Class A and FAI. free flight are part of Group Plan #363 available from Hobby Helpers. During this same period, Stan Peterson and I had been discussing what kind of a free-flighter would beat competition the following contest season. Stan was looking for something new, but couldn't find anything suitable. After 11 years of highly successful contest work with the Cumulus, during which period he had built and flown either 43 or 44 of them(! ), he figured he'd reached the end of the road with that design. While it had served him well, under FAI rules Stan could not rely on a max without benefit of thermals. He knew that other designs had progressed to the point where he was out of contention without thermal assistance. Some years ago Raoul Hoffman convinced Stan that to win, one should pick a good-performing airplane and stay with it until it had outlived its usefulness. He should refine it as necessary, and fly it in practice all he could, getting to know the ship so well that he could easily adjust it for the same predictable performance under all types of contest flying conditions. This is what Stan did with the Cumulus. He came to know this job probably better than anyone except Goldberg, its designer. Stan's work with the Cumulus, plus his outstanding contest record with it, led C. O. Wright to dub him "Stan the Cumulus Man." After a number of sessions, we reduced the design objectives to a few simple fundamentals. Peterson and I agreed that the Sailplane was the finest gliding airplane we had known. So first of all, we rated glide the paramount factor. Sailplane performance or better! We wanted a max under all conditions, with or without thermals. We wanted a good climb, but no skyrocketing at the expense of the glide. Second factor was a straight-out climb. Neither of us have ever believed in the power-expending spiral except as a last resort to control looping. Could a ship be designed to control the power in a straight-out climb, with just enough left turn to get into the glide without a big altitude-killing stall? This led to the third factor - a high-lift stabilizer to bring the tail up fast when power cut, as well as to help the glide. Fourth, and very important, we wanted a consistent airplane. By consistency, we meant a craft not sensitive to minor adjustments-one that could be counted on for flight after flight with the same performance. We were after a crate that could be taken from storage and put in the trunk of a car, carried hundreds of miles in scorching hot weather, then fly right out of the trunk without a lot of time-wasting field tests and adjustments. And the ship had to comply with FAI rules. To meet FAI rules the Sailplane would have to be shrunk. But no matter what approach I took, it always came out looking like a lukewarm Sailplane with a bulky, stubby appearance. The fuselage cross-section did not permit moving the thrust line up by simply adding a nacelle on the pylon. The fuselage would have to be thinned down substantially to give it a graceful appearance and to reduce drag. It also became apparent that I would have to abandon the Sailplane's short coupling and go to longer moment arms. So I finally decided on a completely new approach, preserving only the Sailplane's efficient wing configuration and the elliptical stab utilizing the wing airfoil section. I went to a higher aspect ratio with the Goldberg G-610B airfoil in place of the Sailplane's G-6. I decided to make the fuselage and nacelle as slim and small as, possible without sacrificing structural strength, and planned to streamline the design to a high degree to minimize drag. Result ... Ephemeris. The ship very nearly flew directly off the design board. 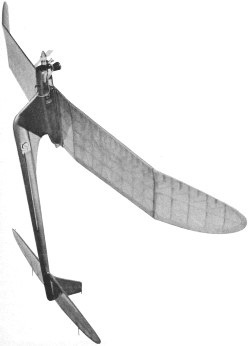 The only modifications found necessary were a slight change in decalage, incidence and thrust line relationships, and a reduction of the rudder area to its present size. Everything else remained as was. Stan Peterson got his finished and into the air before I did; John Trumpus also built one. Stan's and mine had Cox .15 Specials while John's had a Tee-Dee .15. I finished a smaller, 1/2A version before the FAI ship was completed. Test flights showed that we, had achieved our objectives, plus a substantial bonus in the form of a scorching climb. After only six flights Stan had his at full power for 20 seconds. Stan's pathfinding, plus those tests with my 1/2A, enabled me to fly my big one at full power in three flights. John Trumpus did equally well getting ready quickly for competition. The three of us took 6 firsts, 2 seconds, and 3 thirds over a three-month period. Stan Peterson first flew his in competition at the IMAC contest held last July at Bong, Air Force Base, in southern Wisconsin. He was first. I first flew mine at the De Kalb Cloudbusters contest in early August at Bong. Stan also flew his. This, incidentally, was my first contest in 21 years! Carl Goldberg, Stan and I drove up to Bong arriving five minutes before official starting time. Within 10 minutes Stan made the first official flight of the day. He did not do any test gliding or power testing, just gave the engine full power on hot fuel for an official flight. His Ephemeris VTO'ed up in a beautiful straight-out climb for a max with plenty of margin to spare. I then put mine up for the day's second official flight with the same results. However, after that 21 year layoff, I'm afraid I succumbed to "eager-beaveritis." I hadn't properly checked out my timer and was disqualified from a 1-second overrun. Next time up the engine leaned out and quit after 7 seconds. Stan ended in second place after losing fly-off first by only 9 seconds. One week later came the big 19th Annual Midwestern States Championships sponsored by the Chicago Aeronuts. John Trumpus flew his Ephemeris in competition for the first time. I was careful to pre-check my timer run while adjusting the needle valve. John Trumpus and I each got 3 straight maxes, tieing with a third entrant. In the fly-off, mine came in first, and John's third, missing second place by 2 seconds! My four winning flights were the 12th, 13th, 14th and 15th hops the plane had made. Since I had been away from contest flying so long, credit for winning must go to the airplane. In two succeeding contests, Stan, John and I tied for first, going into the fly-off against each other with the same design! We have also flown the 1/2A version with similar contest winning results. About the name "Ephemeris" ... looking for a suitable tag I turned to an astronomy textbook and found that the ephemeris of a solar body is a table of calculated, predictable positions in space at any given time. Since the airplane was being designed to produce consistent, predictable performance, and was intended to be at a certain point in space (as high as possible for as long as possible), "Ephemeris" seemed appropriate. Construction methods used in the ship are very conventional. Data on full size plans.